Orval Day & Funky Bierfest!! 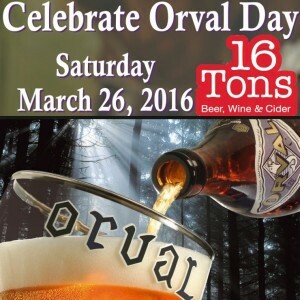 Orval Day & Brett Fest @ 16 Tons Taphouse! Orval served in proper glassware w/ advanced ticket. Brett beers from Breakside, Logsdon, De Garde, Almanac, and more! Details updated soon on facebook events page. We will be serving Orval in proper Orval goblets all day w/ advanced ticket. AND… 6+ Brettanomyces fermented beers! !